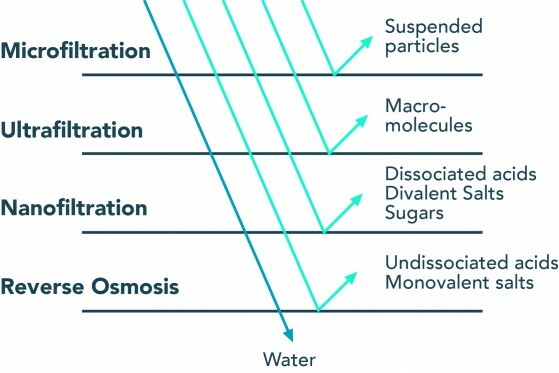 Reverse osmosis (RO) is a membrane technology with myriad applications, but most well-known for its use in desalination for drinking water production. Reverse osmosis water treatment allows passage for only small and weakly charged molecules, such as water. Undissociated acids, such as carbonic acid (H2CO3), can also easily pass through. Carbonic acid is part of the carbonate system and not a contaminant—it affects the pH of the product water. Sodium and chlorine, which only carry a single charge and are also small, can pass through the membrane but not quite as easily as water. Molecules that are larger and/or more strongly charged than sodium and chlorine are rejected altogether. RO membranes are rated by their ability to reject a target compound, which may be radon, disinfection byproducts (DBPs), or viruses. For desalination, ions are the target compound for removal, thus, salt rejection is the most important performance parameter. Membranes with higher salt rejection are categorized as “tight” membranes, while those with relatively less salt rejection are considered “loose” membranes. The terms do not refer to the salt rejection itself, but the fact that membranes that achieve higher rejection also require higher pressures to push water through the tighter membrane. Salt rejection is affected by water quality parameters, including temperature and pH. With increasing temperatures, the membrane diffusivity increases and both water and salts can pass through more easily. Fortunately, the increase in water passage is greater than the decrease in salt rejection. Membrane performance is not highly susceptible to pH change unless near the boundaries of operation. However, pH affects the scaling index of the raw water, and scaling can result in hydraulically irreversible membrane fouling and a loss in membrane water flux. Tight pH control can help prevent membrane fouling, which might otherwise lead to costly replacements of the RO membranes. Additionally, RO membranes can be susceptible to degradation from chlorine. RO membranes are made from one of two materials: cellulose acetate or polyamide, which is formed as a thin-film composite with a polysulfone base. Both materials achieve high performance, but cellulose acetate has some resistance to chlorine degradation while polyamide membranes do not. The trade-off is that polyamide membranes are able to operate over a wider range of pH and temperature than cellulose acetate membranes. The membrane is a small barrier between raw water contaminants and a clean finished water. 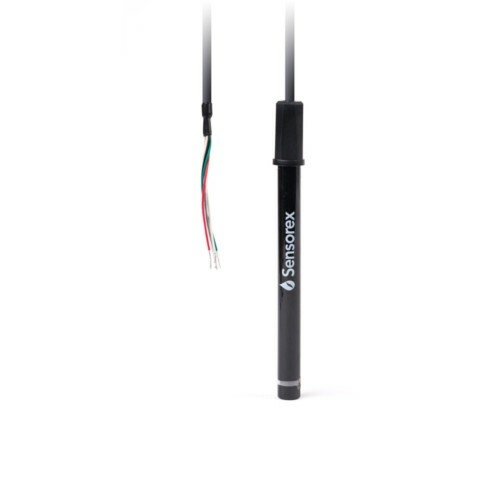 Real-time monitoring is crucial for keeping apprised of integrity issues with the membrane and the process as a whole. While salt can be measured as the total dissolved solids (TDS), the measurement procedure involves evaporating the sample and is time-consuming. Instead, electrical conductivity can be used as a cheap and efficient measurement for estimating salt content. Additional monitoring will ensure that your water is within the parameters acceptable for your membrane. While free chlorine is not permissible ahead of the membrane process, it is often required for the finished water. Off-line testing of chlorine is possible but takes time and is susceptible to user error. Free chlorine monitoring before the membrane confirms complete dechlorination via sodium bisulfate and monitoring after the membrane ensures a sufficient chlorine residual. Chlorine can also be monitored through measurement of the oxygen-reduction potential (ORP). This is a common technique in swimming pool monitoring. A high ORP reading indicates an oxidizing environment and alerts to the presence of oxidizing compounds, including chlorine, ozone, and hydrogen peroxide. A low ORP indicates a reducing environment, which may be a result of excess sodium bisulfate for dechlorination. 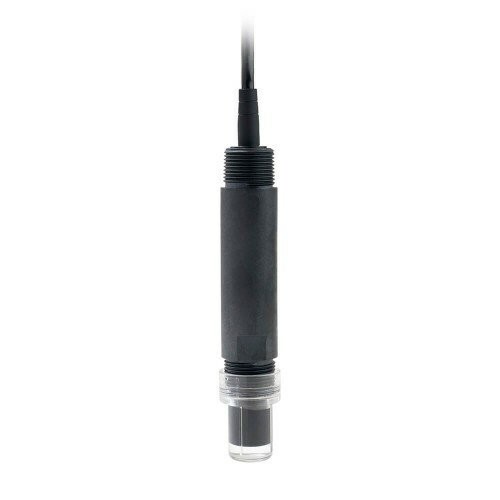 In addition to conductivity and ORP monitoring, online monitoring of pH and temperature provide useful, if not crucial, information to confirm the raw water is within operational parameters.